The Androscoggin Chamber of Commerce is an independent, member-supported organization, which exists to promote a positive business environment throughout Maine's Androscoggin County. Nick Knowlton has been in the IT industry since 1998. Knowlton started his career with an internship at ACORN Products Company in Lewiston, Maine as assistant Network Administrator while attending Central Maine Community College. At the age of 19, Knowlton was asked to take on the role of Network Administrator for the growing organization. This hands on experience to manage and maintain the critical business systems for a multi-million dollar company was the beginning of his career in IT. 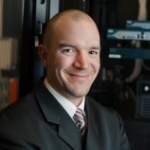 In 2001 Knowlton joined Advanced MicroSystems in Lewiston, ME as an IT Consultant and Systems Engineer, helping small businesses throughout Central Maine navigate their IT needs. Knowlton played a critical role in planning, installation, and implementation for his client’s IT environments. In 2011 Knowlton continued consulting with clients and started Ketch Networks, Inc. (KNI). KNI saw rapid growth which gained the attention of SymQuest® who acquired KNI’s client base and Knowlton’s experience as he joined them as a Virtual Chief Information Officer (vCIO) in 2012. As a vCIO, Knowlton works with clients of all sizes to help manage all aspects of their IT environments. Through working with businesses to plan and budget for on-premise, or cloud based IT services, Knowlton plays a key role in helping clients navigate the constant advances in technology. Knowlton’s experience as a small business owner has helped him manage critical IT projects for business owners throughout Maine. Knowlton has consulted with clients in many industry verticals including: professional services, legal, healthcare, and financial services among others.